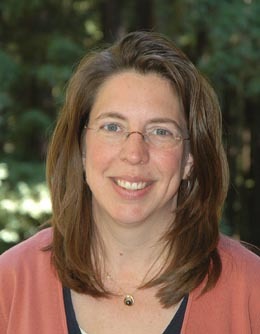 Anthropologist Melissa Caldwell is a leading food policy expert. Photo by J. McNulty. Food policy expert Melissa Caldwell will be among the speakers discussing the global food crisis when some of the world's most innovative thinkers gather in early November for a workshop sponsored by the Bill and Melinda Gates Foundation. Caldwell, an associate professor of anthropology at UC Santa Cruz, welcomes the opportunity to broaden the terms of the discussion of global hunger, food production, and distribution. "Representatives of corporate agriculture, the World Bank, and the International Monetary Fund make it sound like new agricultural technologies will take care of everything, but hunger and food insecurity are far more complex than that," said Caldwell. "Politics, war, geography, and even consumer preferences play key roles in whether people are hungry or not." Caldwell, coeditor of The Cultural Politics of Food and Eating and author of Not by Bread Alone: Social Support in the New Russia, will join representatives of academia, government, nongovernmental organizations, and multinational corporations when they gather November 8-9 at McGill University in Montreal, Canada. The workshop will focus on three factors that organizers say are contributing to the current food crisis: Food prices have jumped more than 80 percent in the past three years; obesity and other diet-related chronic diseases are driving skyrocketing health-care costs; and outbreaks of cross-national food contamination are increasing as national and global food safety systems are breached. Solutions lie at the interfaces between agriculture, agri-food business, and health systems, according to organizers of the McGill Health Challenge Think Tank's "From Crises to Convergence: A Multi-Track Pathway for Green Revolution Version 2.5." The workshop will bring together experts in agriculture, food production, marketing, finance, health, nutrition, and community development to foster discussion and generate "convergent" policy strategies. The title of the workshop refers to the evolution of global food-security strategies. Green Revolution Version 1.0 began in the 1950s with a focus on high-yield varieties, more fertilizers, and irrigation. Green Revolution Version 2.0 focused on increasing the productivity of small farms in subsaharan Africa and South Asia to move millions out of extreme poverty and reduce hunger. Green Revolution Version 2.5 represents a "multi-track" approach to worldwide sustainable food and nutrition security. Caldwell will participate in a panel presentation on the "twin-track" approach to Green Revolution v2.0 with scheduled fellow panelists Prabu Pingali, head of agricultural policy and the statistics division of the Bill and Melinda Gates Foundation; Franck Attere, chief adviser of the Alliance for a Green Revolution in Kenya; Wayne McKnight, president of McKnight Insights & Solutions, and former global vice president of food procurement for Wal-Mart; and Pam Talbot, president and chief executive officer of Edelman. Note to journalists: Caldwell may be reached at (831) 459-3856 or via e-mail at lissa@ucsc.edu.